It’s a big day at MasterCare with the DREAM BIG AWARD! 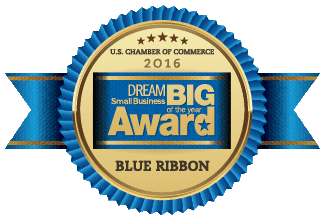 The U.S. Chamber of Commerce today announced MasterCare of Columbus, NE as a winner of its annual DREAM BIG Blue Ribbon Small Business Awards®, recognizing 100 companies for their success and their contributions to America’s economic growth and vitality. On March 9, the Chamber will announce seven regional finalists from among this year’s Blue Ribbon Small Business Award® winners. All of this year’s winners will be honored at the 12th annual America’s Small Business Summit, which will take place June 13-15 in Washington, D.C. During the summit, one regional finalist will receive the DREAM BIG Small Business of the Year Award, sponsored by Sam’s Club®, and a $10,000 cash prize courtesy of the U.S. Chamber. All Blue Ribbon Small Business Award® winners are also eligible for the Community Excellence Award, which recognizes one business that has found notable success in the eyes of its community. The winner of that award will be decided through online public voting to take place February 18 through March 4, 2016. Please take a moment to Vote Here!